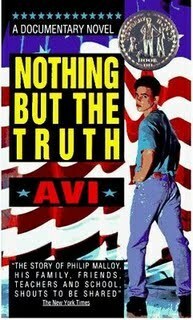 Last night I read Nothing But the Truth by Avi (#527 in the FPL collection). Somehow, I’d made it years without reading Avi, a YA staple, and I whizzed right through this one in a couple hours. I was surprised by the subject matter, wondering if some of the adult concerns (budget woes, tenure, etc.) might go over the head of the book’s intended readers. Still, I enjoyed the somewhat gimmicky epistolary/dialogue format, and respected Avi for writing a protagonist at times both pitiable and frustrating (A Wrinkle in Time’s Meg Murray comes to mind). In short, I don’t know if the 1991 cover (and complete absence of a back-cover blurb!) would make this book a natural choice for the older readers of our library, but its complex dealings with moral issues make it one I might recommend.